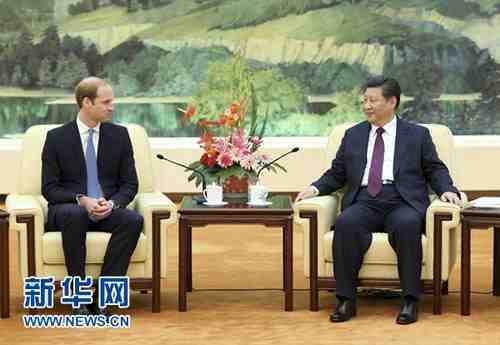 On 2 March 2015, President Xi Jinping met with the Duke of Cambridge at the Great Hall of the People. President Xi expressed his welcome and asked the Duke of Cambridge to convey his cordial greetings and best wishes to Queen Elizabeth II. He told his guest that he looked forward to visiting the UK this year at the invitation of the Queen and to working with British leaders to jointly map out the future of China-UK relations. As President Xi pointed out, both China and the UK are major countries with global influence, extensive shared interests and common responsibilities for promoting world peace and development. The two countries enjoy good relations. Their comprehensive strategic partnership is moving into the fast track. Two-way trade has exceeded $80 billion dollars, the UK is a top destination for Chinese investment and bilateral cooperation in finance, nuclear power and high-speed railway has made fresh headway. The two countries have agreed to make 2015 the China-UK Year of Cultural Exchange. As important representatives of the oriental culture and the Western culture, China and the UK surely have a great deal to contribute to world civilization and progress through closer exchanges and cooperation between them. President Xi noted that the British Royal Family holds great influence not just in the UK but across the world. Over the years, members of the Royal Family have shown great interest in and support for China-UK relations, and have done a lot and contributed positively to exchanges and cooperation between the two countries in areas ranging from trade and environmental protection to people-to-people and cultural exchanges. The President expressed Chinese side's appreciation for such efforts and extended welcome to other visitors from the Royal Family. The Duke of Cambridge presented President Xi with a letter of invitation from Queen Elizabeth II and indicated that the Queen was looking forward to welcoming President Xi to the UK. He mentioned that UK-China relations went back a long time in history and that he had always wanted to come and visit China. He also noted the rapid growth in bilateral trade and people-to-people and cultural exchanges between the UK and China in recent years. The Duke's current visit, personally regarded as educational, will bring him to Shanghai for the launch of the GREAT Festival of Creativity and to Yunnan for a taste of the province's unique culture. The Duke was looking forward to strengthening China-UK friendship and cooperation, especially exchanges between the young people, so as to facilitate better understanding about each other and about the world, and move the bilateral relations forward. The two also talked about sports with great interest. President Xi mentioned the Duke's love for football and said that China was ready to learn from world-class football teams such as those from the UK. China and the UK have had some useful experience in working together on football, including a letter of intent signed between the Chinese Super League and the English Premier League in 2013. There will also be a series of martial arts and qigong events and matches between the two countries. The President hoped that the Duke would continue to support sports exchanges and cooperation between China and the UK. The Duke said he was aware that President Xi was also a football fan and that he would like to see more Chinese players in the Premier League. He recognized the good cooperation between the UK and China on hosting the Olympic Games. He hoped that the two countries would continue to strengthen cultural exchanges, including cooperation in the field of sports. The two also exchanged views on wildlife protection. President Xi briefed his guest on China's policy and efforts in protecting elephants and other wildlife, and he indicated China's readiness to strengthen international cooperation. The Duke of Cambridge expressed great appreciation for China's efforts and hoped to see China becoming a leader in wildlife protection. State Councilor Yang Jiechi attended the meeting.